Learning from the past:- " The problem in trying to be perfect or atleast posing to be near-perfect is that one mistake would crush up that entire edifice..And it would be a pain to recover. " .. Recent Learning:- " The problem in being imperfect is that you might get blamed for mistakes happening around you because of your imperfect nature even-though you are not responsible for it ". Current Mood :- Philosophic & Confused. An old comedy scene from a mallu-movie in the 1980s... Seldom has Lal acted like this in recent times.. Non-Mallus, please excuse.. 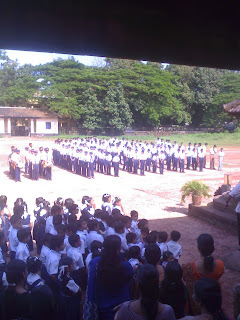 Ask your mallu friend to see this and explain it to you..
Have you ever tried going back to your high-school for Independence day celebrations ? I did that today..Was lazing at home for the last couple of days.. 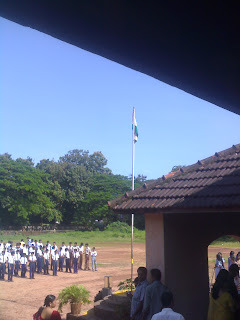 So, just thought of going to my School ( N.S.S High School Calicut ) for independence day.. And it was a different experience..Standing near the school assembly,hearing the band set, national anthem etc..Phew...It has been 9 years since I passed out of this institution ( 98 SSLC batch ).. And when you go back to such a place , nostalgia will strike you quite heavy..I go there once in a while,but this trip was special.. Some of the teachers who taught me are still there..One of my classmates is a teacher there now..It was quite nostalgic when teachers recollect the experiences they had with us.. It seems they too miss us sometimes. :) .. The school also reminded me of my adolescent crushes.. The 'discussions' we friends used to have ( ofcourse about the gals :) )-- Yeah , we were quite naughty during those days.. Among our classmates, we had a guy whom all of us used to make fun because of his 'ignorance' in those matters..But, apparently he 'invested' his time very well during engineering college..He got married 3 months before :) and we 'scholars' are still single ( and eligible :P ) .. In this connection, check out this article by Jiby about his Loyola days..Somewhat filmy & funny :) . It would remind many of you the 'games' you played during your school days. Guys,gals ..Do make trips to your school on such occasions .. These things are really nostalgic :) . An idea which came to my mind around 6 - 7 months ago finally culminated in this => BlogPane. I and my friend Antony Jerome in our spare time worked on this and today we are presenting you a tool to keep in touch with your college alumni and students who are into the blogosphere . No hassles like registering on a site or creating usernames or anything like that..Few clicks, you are on a different plane in blogosphere !!! !